The first ever POETRY MEETS POTTERY event, which will include the first rhymed couplets contest, will be held at the Clay Studio on Saturday, February 27, at 2:30 PM. The Poet Laureate of Edgefield, Laurel Blossom, would like to invite all and sundry to attend the event, at which the winners of the couplets contest will be announced. 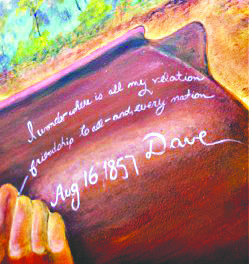 The contest, in honor of DAVE THE POTTER, master craftsman who wrote rhymed couplets on the shoulders of a number of his jars, was inaugurated in January, 2016. Blossom has visited the schools to promote student participation and has offered workshops at the Edgefield County Public Library for the public. As of the February 12th deadline, well over 100 couplets, representing one couplet per person, had been submitted to the contest. There was no segmentation of the contest: each competed against all. Couplets were judged by Laurel Blossom, Poet Laureate of Edgefield, Camara Brown, Youth Poet Laureate of Edgefield, poet Calvin Butler, educator Mary N. Bates, and County Council member Betty Butler. A cash award of $100 will go to the winner. Second place winner will receive a cash prize of $50, and the third place winner will take home $25. 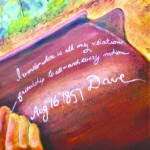 The winning couplet will be inscribed on an Edgefield pottery jar contributed by Justin Guy, master potter at the Old Edgefield Pottery. As of this writing, it is hoped that, despite the fact that the Old Edgefield Pottery has been closed (to be reopened later this spring under new management and with a new name), the prize jar will be prominently displayed (wrapped, like a mystery!) during POETRY MEETS POTTERY on a table or stand. When it is unwrapped, the winning couplet will be revealed! All participants will have the opportunity to read their couplets aloud to the assembled audience. Refreshments will be served.